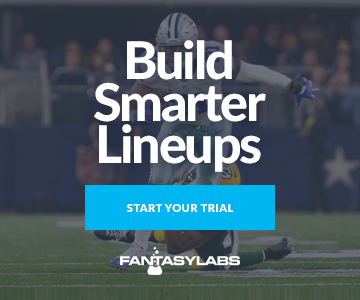 In the weekly Fantasy Trends, we leverage the Trends tool to find quarterbacks, wide receivers and running backs with notable data points for the upcoming DFS slate. For more of our weekly football content, visit our NFL homepage. There are three games scheduled for Thanksgiving Day, highlighted by an epic 60-point total game between the Falcons and Saints in the Superdome. So in honor of the holiday, I wanted to examine fantasy trends for Thanksgiving games over the past four seasons. It would of course be ideal to isolate only Thanksgiving Day games in our sample, but unfortunately four seasons worth of DFS data only yields 12 games to analyze. That sample size isn’t large enough to produce statistically meaningful results … so I improvised. All six teams in action on Thursday will take the field on only four days of rest, having each played this past Sunday. In fact, short-week turnarounds are fairly typical for teams playing on Thanksgiving. By investigating trends related to short-week turnarounds like this, we can infer conclusions regarding Thanksgiving games generally while also teasing out statistical edges for each of the three games on deck this week. I’ve subdivided our sample based on both home/road and favorite/underdog splits in order to evaluate the effect that the venue and Vegas spread has on player performance on a short week. Check out our live odds page for up-to-the-minute betting lines and percentages. Favorites have a clear advantage on short weeks. Home favorites boast by far the highest consistency percentage, a respectable average Actual Points result and a Plus/Minus of +0.58. Road favorites have produced a big Plus/Minus of +1.93, but our sample is rather small, and consistency is below average. This could suggest that results for road favorites could be skewed by a few big performances, which means it’s best not to place too much weight on this result. Home favorites are clearly the best bet on the board. Meanwhile, underdogs have produced poor all-around metrics regardless of venue. The following quarterbacks fit our trend as home favorites on a short-week turnaround. The following quarterbacks are underdogs on Thursday and could be subject to downside risk based on our trend. Among this group, Stafford stands out as a particularly risky play this week. Wide receiver Marvin Jones (knee) has been ruled out along with Kerryon Johnson (knee). Bruce Ellington (back) is also questionable. The Lions have had difficulty protecting Stafford since trading away Golden Tate, and now they face a monumental challenge against the Bears elite defense. Without Johnson to keep the chains moving and Jones to provide big play upside, Stafford and the Lions could struggle at home against Chicago. Interestingly, road favorites boast the highest average Actual Points scored. Other than that, there’s relatively little separation among our running back samples. Home favorites feature the best overall metrics, whereas road underdogs definitively offer the least upside of any group. The following running backs fit our trend as favorites on a short-week turnaround. Bears quarterback Mitchell Trubisky (shoulder) is doubtful to suit up. If he’s unable to play, Chase Daniel will draw the start for Chicago. With Daniel at the helm, head coach Matt Nagy could opt for a more conservative game plan featuring Howard in the running game. Cohen’s fantasy outlook is murkier. On the one hand, Daniel might progress through his reads more quickly, which could elevate Cohen’s target volume as a check-down option. On the other hand, the Bears might struggle to sustain drives, which could limit Cohen’s overall volume of opportunities. Howard is likely the safer cash game play, while Cohen is likely the preferred tournament option. The following running backs are road underdogs on Thursday and could be subject to downside risk based on our trend. Home and road favorites both perform above expectation on short weeks, offering high Plus/Minus scores and consistency percentages. Conversely, home underdogs are clearly the group to avoid. Their negative Plus/Minus result and low consistency substantially limit their fantasy potential. The following wide receivers fit our trend as favorites on a short-week turnaround. Trubisky’s injury casts a shadow of uncertainty regarding the Bears receivers listed above. Additionally, Smith is questionable due to a foot injury, and the Cowboys have a high Run Funnel Rating against the Redskins. These extenuating circumstances raise questions for almost every wide receiver in the list above, except one: Thomas. Thomas is in a phenomenal spot against one of the worst pass defenses in the NFL. He’s our consensus No. 1 fantasy wide receiver this week, and could see even more passing targets if Smith is unable to suit up. The Saints also boast the highest implied team total (36.5) on the slate, which substantially boosts Thomas’ scoring upside. The following wide receivers are home underdogs on Thursday and could be subject to downside risk based on our trend. Home favorites offer positive expected outcomes for every skill position except tight end. Tight ends as favorites at home have historically produced by far the worst average Actual Points, Plus/Minus and consistency scores among our tight end samples. To add insult to injury, home favorites also average the most Expected Points, which implies that they are more expensive on DraftKings on average. The real value is to target underdogs. Both home and road underdogs boast a Plus/Minus of +0.46. Tight ends playing on the road as underdogs also offer the highest average Actual Points, and by far the highest consistency percentage (47.6%). The following tight ends fit our trend as underdogs on a short-week turnaround. The following tight ends are home favorites on Thursday and could be subject to downside risk based on our trend. After this piece is published, FantasyLabs is likely to provide news updates on a number of players mentioned here. Be sure to stay ahead of your competition with our NFL news feed.